You don’t have to spend a lot of money to have a good time in Santa Fe, New Mexico! There are more than enough ways to enjoy your stay at Four Kachinas without breaking the bank. Whether you’re interested in art, nature, history, or shopping, there is something for you to do. Put away your wallet and enjoy these free things to do in Santa Fe! Are you a fan of freebies? You’ll love our complimentary Vacation Guide! Planning a vacation can be challenging, so we created this free guide to save you hours of research. In it, you’ll find restaurants, attractions, and even more free things to do in Santa Fe! Did you know that many museums offer certain hours or days that you can visit free of charge? All you have to do is enquire which days or times are free in advance. For example, the popular New Mexico History Museum and the New Mexico Museum of Art offer free admission between 5 and 7 PM every Friday. Sundays are also free for residents of New Mexico! A trip to Santa Fe would not be complete without a stroll through the Santa Fe Historic Plaza! Walk through the monuments before you sit down and relax on one of the benches. At the heart of the city, this area is always bustling with people. Window shop at the stores lining the streets or wander through an outdoor market being held here! When you’re in Santa Fe, it seems as if there is a gallery around every corner. In a place where the arts are so prevalent, there are plenty of ways to immerse yourself in this aspect of the culture. If you’re looking for free things to do in Santa Fe that involve art, look no further than Canyon Road. It is dotted with more than 50 galleries for your viewing pleasure! See everything from intricate paintings to cultural treasures like hand-woven Navajo rugs. Santa Fe is full of architectural marvels. One of our favorites is the Cathedral Basilica of St. Francis of Assisi! Once you see it, you’ll know why. This towering cathedral stands out amongst the traditional adobe buildings on the street. This church is open daily to the public where you can go inside to marvel at the stained glass windows and learn a little about its interesting history. Once you venture outside the city, wide expanses of land open up. Many hiking trails can be accessed for free! One of the best places for exploring the area is the Atalaya Mountain Hiking Trail. Choose from 3 different routes that range in difficulty. 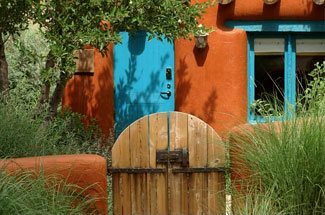 You’ll climb through pinon scrub and rusty ponderosa pine before reaching the top where you will be rewarded with incredible views of Santa Fe’s adobe spread! Although parts of the uphill trek may be challenging, the amazing view is worth it. 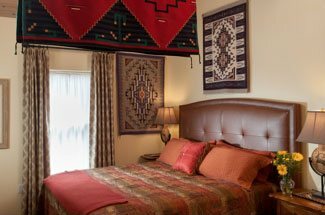 If you’re looking for a budget-friendly stay in Santa Fe, take advantage of the specials and packages we have at Four Kachinas. Our Book Direct Special will ensure you always have the best rate! Our bed and breakfast is the best way to experience the city; it’s close to tons of free things to do in Santa Fe! Start your day with our delicious breakfast to start your day off right, then enjoy what our amazing area has to offer.